How and Where to Buy Plaquenil Online? Make sure you have a valid prescription from your doctor. Then you can order your prescription of Plaquenil right here at CanadianPharmacyWorld.com and check out How To Order. If you’d prefer, you can also place your order over the phone by dialing 1-866-485-7979. We carry both the brand name Plaquenil and its generic counterpart in stock. Are there Alternative Names for the Brand and Generic Plaquenil? The brand name drug Plaquenil is manufactured by Sanofi Aventis and our supply is distributed by Turkey. 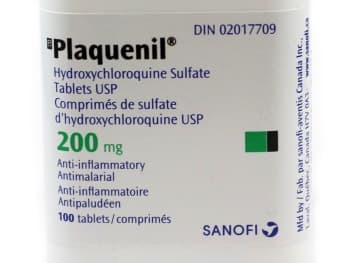 Plaquenil does have a generic equivalent called Hydroxychloroquine, which has its distribution center here in Canada manufactured by Apotex, and the United Kingdom. What Dosages and Forms is Plaquenil available in? The brand name Plaquenil is available in a quantity of 90, in the 200 mg dosage. Hydroxychloroquine, the generic version, is also available in the 200 mg dose, but in quantities of 60 & 120 from the UK, and quantities of 100 or 200 from Canada. Plaquenil is used in the treatment or prevention of Malaria, which is common in Africa, South America, and Southern Asia. It can affect those who live or visit these countries. Malaria is a diseased transmitted by the native mosquito, and develops as parasites enter the body through their bite. Plaquenil is also an effective treatment for symptom of rheumatoid arthritis, discoid, and/or systemic lupus erythematosus. What are the Possible Side Effects of Plaquenil? If you’re allergic to Hydroxychloroquine, Plaquenil is not the drug for you. Talk to your doctor about other options available and be sure to declare any medications you are currently taking or recently stopped taking. Are there any Precautions and Drug interactions of Plaquenil? Long-term treatment with Plaquenil should not be used on children, and is not approved for anyone younger than 18 years old. Avoid antacids or Kaopectate four hours before or after taking Hydroxychloroquine. Antacids may make it more difficult for the Hydroxychloroquine to be absorbed in the body. Plaquenil is a tablet and should be stored at room temperature, away from extreme heat or extreme cold. It should also be stored away from direct light. When on Plaquenil, you may need to have frequent blood and vision tests to ensure your safety from certain side effects. An overdose of Plaquenil can be fatal, and especially so with children. If you suspect an overdose, seek immediate emergency help or call Poison Control at 1-800-463-5060. Plaquenil, when taken long-term or at a high dose can cause irreversible retina damage. Be sure to stop taking Plaquenil and call your doctor if you experience streaks or flashes of light in your vision, notice swelling or color changes in your eyes, or have extreme trouble focusing.